Sick and tired of always bitching about online dating and sick and tired about continually talking about trying to find new ways to get out there and meet men, this week I made an actual effort to go to events where I knew the actual purpose of the night was to mingle and to meet men. F**k Valentines – Just Party. THE best name for a Valentines Day event, ever. I think it pretty much sums up how most people (that I know) feel about the very annoying and very much dreaded V-Day. The annual event, which is run by Clicktonight.com (the site that interviewed me last month HERE), does exactly what it says on the tin. You’re single, you want to escape all of the horrid Valentines Day hoo-hah, but you don’t want to stay home alone and wallow? This was the place to be. All in all; a gorgeous club, GREAT music (the DJ was my favourite man there, thanks to his knowledge of 80s/90s R&B and Hip Hop) and a nice choice of happy hour cocktails. To be honest, I didn’t meet any men. Hell, apart from the DJ, I didn’t even talk to any men BUT, I did have a lovely night out with the girlies. We left at the point where it felt like slightly sozzled men were scouring the crowd for single women desperate enough to get off/go home with them but hey, I guess that’s what some people go to single parties for, isn’t it?! Compared to last Valentines Day, at least this year I got off the sofa, stopped feeling sorry for myself, stayed away from M&S Chunky Chocolate Cheesecake and did something different. A very successful Valentines Day! (By my standards anyway). I had speed dated a couple of times approx ten years ago and remembered that even though I never met the love of my life, I always enjoyed the process. This event was run by SpeedDater who, according their site, are the UK’s market leader in events for single people. Beforehand we had to set up profiles on the SpeedDater website – the fact I was sent eight messages before I’d even filled out details or added a pic, made me a little (ok, a lot) sceptical of exactly what sort of dating site it was. On the evening, we turned up, registered (name badges with a number on) and were told to sit at the table where the number matched our badge. Us lovely ladies were told to stay at our tables and the men would move around at a three minute intervals. We had dating cards on which to scribble down names, badge numbers and to tick ‘yes’, ‘no’ or ‘friend’. Over the weekend everyone has to log back onto the site, go to the specific event page and using our dating cards as reminders, tick people we’d like to see again. In a day or two, we will know our matches. The online element is pretty clever and definitely different to how I remember speed dating being done a decade ago. I really enjoyed the evening. I loved speaking to different people (some more than others), I got to speak with 21 men in one night (that never happens) and to top it off, with the exception of a few, the men generally weren’t as weird or horrible as I was worried they would be. I came away from the evening having picked three ‘yesses’, seven ‘friends’ and 11 ‘no’s’ and my lovely wingwoman had picked two ‘yesses’, six friends and 13 no’s which made us realise that maybe we’re more open minded and less fussy than we originally thought. So yup, a pretty busy Valentines Week. Will I get any dates out of it? Who knows and who cares? The important thing is… I had FUN!!! ← Is A Personalised Dating Service The Way To Go? Glad you had a blast!! I went speed dating for the first time at the end of January and had an awesome time – plus have had two dates out of it 🙂 Hope you get some dates from your event! Hooray for FUN! I’ve always been skeptical about speed dating because I thought all the guys would be weird, too. Glad to hear it’s not the case! 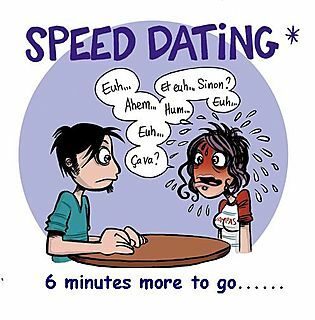 Personally, I prefer speed dating to online dating. You can’t beat getting first impressions in the flesh. Plus, it’s really fun to get to talk to a whole bunch of people you would normally never get to. Don’t meet anyone you’re romantically attracted to? Who cares when you’ve had a fun evening?